Straight lines seen on chert faces hint at interesting phenomena. Usually they mark the horizontal direction during silicification, as in agates where they are known as onyx or Uruguay bands. The straight lines on the peculiar-shaped Rhynia sections pictured below defy such interpretation. It appears that they can reveal something about the silicification process. Rhynia cross-sections with peculiar shapes providing clues concerning details of the silicification process. Width of the picture 4mm. The terrestrial vegetation growing near hot springs in the Lower Devonian landscape at Rhynie was occasionally inundated by sudden flooding . The silica-rich water eventually became super-saturated and turned into gel. 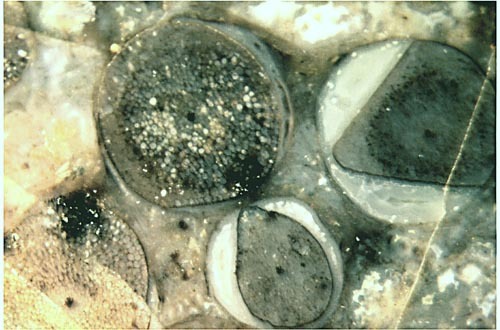 In the case considered here, this occurred when the Rhynia stems were still upright and perfectly round, with the epidermis still intact as it served as an efficient diffusion barrier for silica. This can be concluded from the fact that they were not yet silicified when the surrounding water was. (Walls of dead cells can be permeable even to larger silica clusters. See Rhynie Chert News 27.) Subsequently the stems underwent some process of differential decay with softening and shrinkage of the interior while the more persistent epidermis retained some of its mechanical strength. From a mechanical point of view, the cross-section with the most uncommon aspect suggests the easiest explanation: Apparently the tissue except epidermis was in such a state of decay that it did not offer any resistance to deformation and behaved rather as a fluid. Let us consider the succession of steps from circular shape to the peculiar shape on the right: Tensile stress due to shrinkage built up along the epidermis while it stuck to the surrounding silica gel. This circumferential tensile stress combined with the curvature implies the presence of radial tensile stress at the interface between epidermis and gel. (From the balance of forces follows that the radial tensile stress is proportional to the ratio of epidermis thickness and radius of curvature.) The stress eventually caused the epidermis to detach from the gel at a mechanically weak spot at the interface. Once a small area has been detached, it extends by peeling off, a process governed by the peel strength. The epidermis did not easily peel off but reluctantly separated from the surrounding gel, pulling itself straight. One might expect some resistance of the interior against this pulling-straight but there is none here since there is no strength left and no volume balance as the water can slowly move across the epidermis and possibly also escape elsewhere along the shoot. The epidermis had become detached at two spots. The detached areas got larger until they met, whereupon the tensile stress relaxed while the edge was rounded off. For reasons unknown, the shrinking Rhynia seen in the section below detached more readily from the surrounding gel, and for the one above, silicification was faster than decay so that it became well preserved. All the while, the emerging cavities kept filled with water entering by diffusion, which can be concluded from the fact that no traces of air bubbles are seen here. Because of the big size of hydrated silica molecules compared to water molecules, the diffusion of dissolved silica through the surrounding silica gel into the water-filled cavities was so slow that fungus hyphae could thrive there while the silica concentration was low. (One hypha is vaguely seen in the upper cavity, ending at a white spot.) When the silica concentration in the cavities had become sufficiently high, a thin layer of gel made a lining along the cavity walls and a coating around the fungus hyphae. The epidermis gradually lost its diffusion barrier effect so that silica entered into the tissue and preserved it at a certain stage of decay. With ever more silica arriving via diffusion, the remaining water pockets became jellyfied, and the water-rich gel gradually became more solid and finally turned into chert. The slight kink which the long crack on the right got when running through the former cavity possibly indicates that solidification was not yet complete there. It must be mentioned that usually the plants and organic debris become silicified first while the surrounding water or mineral mud remain fluid for some time. This is due to the fact that the slightly acidic decay products of organic matter favour the deposition of silica. Samples with evidence for a reversed sequence of silicification as in the present case indicate super-saturation of the silica-rich water which turned into gel before the silica could enter into the plants. Silicification of the plants is delayed if they stay alive after partial flooding. Possibly this has been the case with the sample considered here, where several hundred Rhynia stems are there in upright position. The upper parts of most of them are not contained in the chert layer. Apparently they were above the water level of the shallow pool. This could have enabled the whole plants to stay alive after flooding for some time and keep the silica out. Finally it is emphasized that the wealth of conclusions drawn from the one picture shown above are meant to be not merely speculative but rather soundly substantiated. N.H. Trewin : The Rhynie cherts: an early Devonian ecosystem preserved by hydrothermal activity. Scott. J. Geol. 28(1992), 37-47.